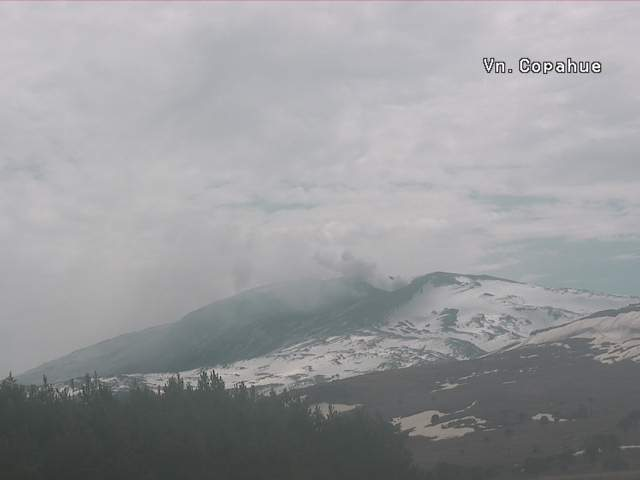 It is interesting to note that not long after we had revealed Aso as #4 in our NDVP series, activity seemed to intensify and cause expectations of a large eruption, possibly even the “Big One”, within the near future. 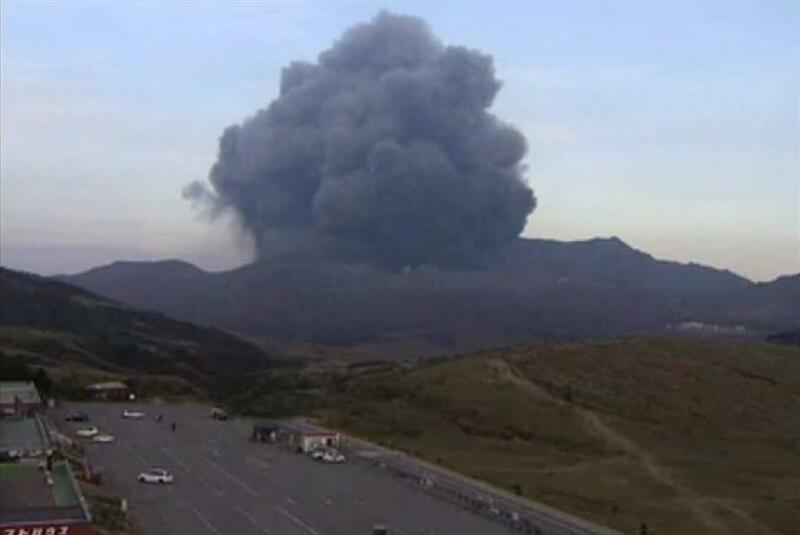 Such excitement is only natural but is Aso really on the verge of a major eruption? There is a philosophical thought experiment to raise our awareness about the connection between our observations and perceptions of reality – “If a tree falls in a forest and no one is around to hear it, does it make a sound?”. Leaving philosophy behind, we can use that as the starting point of another observation: One day you hear a sound from the forest that you have never heard before and when you turn around to investigate, you find that a tree has just fallen. From that day on whenever you hear a loud noise from the forest, you conclude that another tree has fallen. It is similar with Aso. 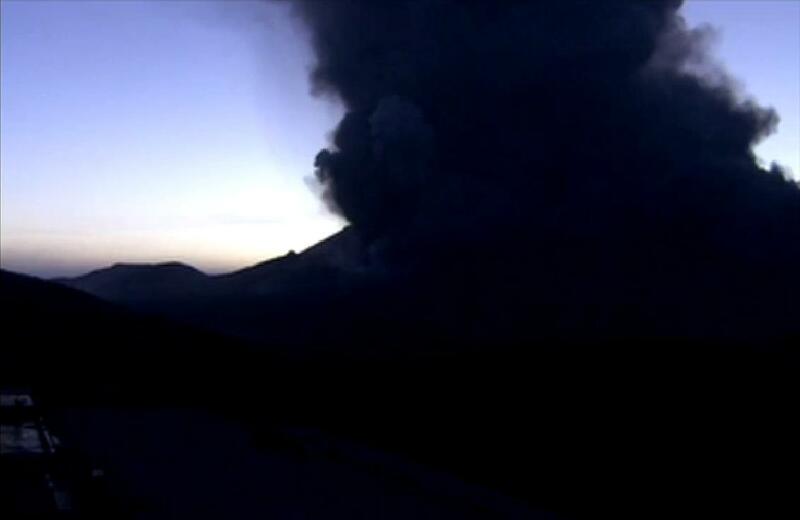 After Sakurajima, Aso is the most active of all the volcanoes of Japan. Periods of unrest are not uncommon and are associated with the intrusion of minor amounts of juvenile magma into the inferred sill structure at ~15.5 km depth. Such an intrusion or series of intrusions can lead to heightened activity over a longer period of time such as happened in 2006-7. 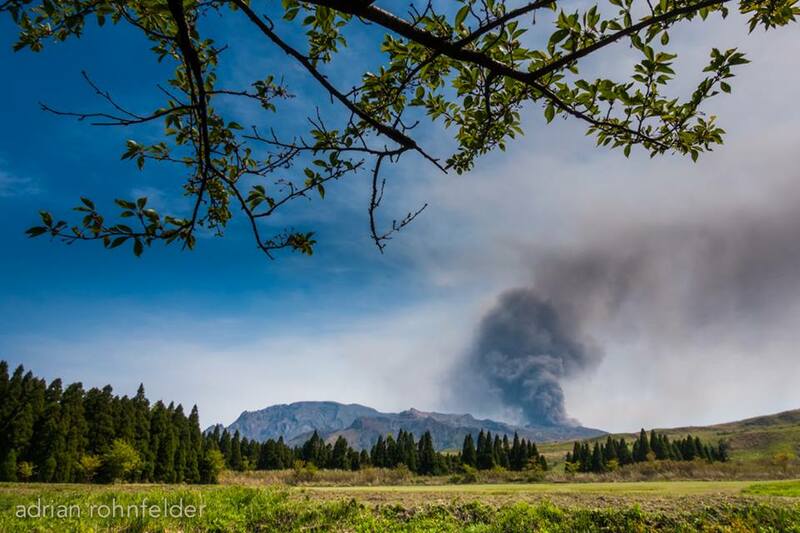 Analysis of recent ash emissions at Kyoto University show that only a very small portion can be attributed to fresh magma and that it is almost exclusively older rock that has been pulverised by the explosions. They are thus phreatic in nature. Some landmarks visible in the NHK webcam view: The extent of the crater mouth as established by observations of explosions is delineated by the vertical lines. A – ash laden slope, riddled by small shelters designed to protect from ash and minor rocks. B and C – cable lift stations of the Mt Aso Ropeway . D – “Observation ridge”. To judge from several days of observing the webcam, this is as far as the general public is allowed to approach the crater and during daytime, the ridge is almost always packed. So what is happening? Well, with the infusion of juvenile magma at depth, energy in the form of heat enters the system and even if the magma itself remains at depth, heat rises in the system together with volcanic gasses (read “superheated steam”, e.g. water at very high temperature and pressure) and spreads upwards through pre-existing cracks and fissures. As the “superheated steam” approaches the surface, it will reach a critical point where it instantly flashes into steam proper, increasing its volume by a factor of hundreds of times. It is exactly as if a large charge of dynamite was set off. The immediately surrounding rock is pulverised and cracks form through which the mix of steam and pulverised rock is ejected. 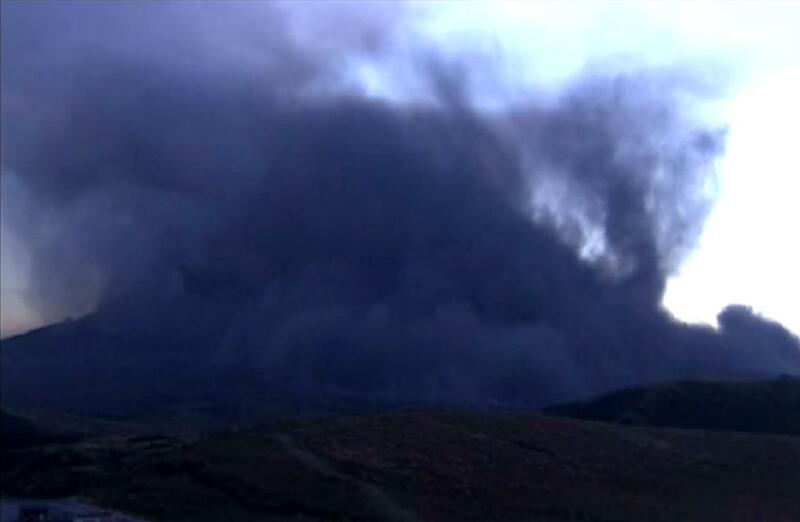 This is what we are seeing on the webcams. Over time, these explosions will weaken and erode away the lid of rock enclosing the upper magma reservoir which is thought to lie between about 4 – 10 km depth, contain around 100 km3 of magma which contains at least 10% melt. At present, this is much too low – it needs to approach 40% before becoming “critical” – to be a cause for immediate concern. For Aso to have a major eruption, a major infusion of fresh magma on the order of at least 100 times greater than those observed over the past decades, is required. At present, there are no signs to indicate that this about to happen. However, one should never discount the possibility of a major eruption as being “impossible”. This is clearly illustrated by the 1886 eruption of Mt Tarawera where several cubic kilometres of basaltic magma apparently traversed the entire thickness of the crust in a matter of a day and a half. The c. 2.1 kY BP basaltic VEI 6 ignimbrite eruption of Masaya, Nicuaragua, is another example of what a nasty substance water can be in the wrong location. The reason Aso made it to number four in the NDVP list is the huge serpentinised (water-rich) wedge sitting just below the crust and that such a wedge can result in very large quantities of the water-saturated magmas required for a very large eruption within a very short lead-up time. Let me finish by stressing the point that is not what we are seeing at the moment but beautiful examples of phreatic explosions. I did a paper napkin calculation to give an idea of what one gets when water flashes into water vapour. 1 liter of water at STP (standard temperature and pressure) when converted into vapour (steam) gives 1244 liters of vapour at STP. That is an expansion ration of 1244 to 1. However, in volcanic explosions the water vapour is likely to be at a temperature very much greater than the boiling point of water of 100 degrees C. Using the ideal gas law: PV = nRT one sees that the volume (V) of gas is proportional to the temperature (T) expressed in absolute degrees Kelvin ( R = Boltzmann constant, n = no. of molecules) therefore the expansion ration will be very much greater than 1244 to 1 accounting for the violence of phreatic explosions. 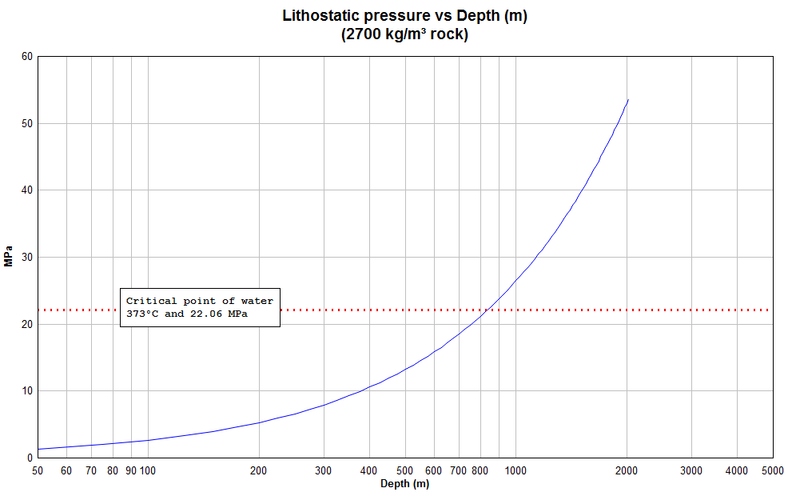 At 650C and 100 bar, 1 l of water holds 3.7 MJ of energy. This means that a body of water the size of an average bedroom at this temperature and pressure releases the equivalent of about 25 tons of TNT. Well, if you’re gonna stick it out there and risk getting stepped on, so will I. The important thing here is that below the depth of the critical point pressure, it really doesn’t matter how hot the water is heated, it is indistinguishable from steam. Once it gets above that depth, it can flash to vapor if it is above the requisite temperature. Caveat: Not an engineer. Just some guy whiling away a Saturday afternoon. Thanks Henrik. 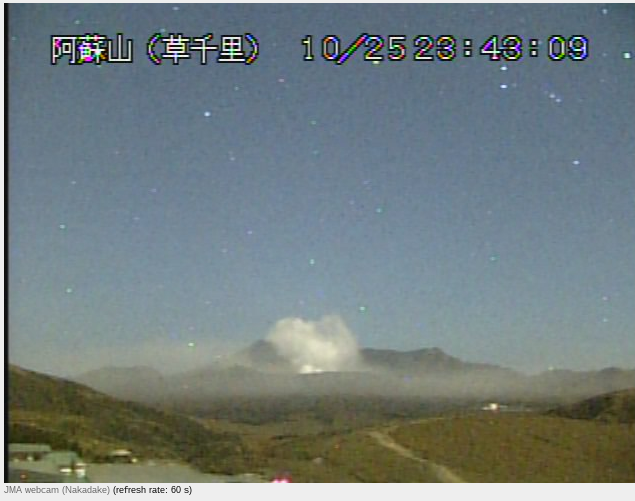 Aso is an interesting place to be right now. I did Google Street View on the car park visible from the web cam, and you can get to see a lot of detail on the ground down there! Looking at the web cam for a while, I’m amazed no-one has been run down or involved in a multi-vehicle pile up. Two days ago someone drove in and did a few donuts before parking! Even the well-behaved Japanese need to let off steam some time. Or was that their volcanoes? I’m always impressed with the night vision of the JMA camera at Mt. Aso. Note the stars in the image. There was a little line of tremors under Bardabunga over the last 48 hours. I wondered if anyone had any thoughts. There has been a little bit of activity here for some weeks now. The magma chamber may be refilling a bit: it lost 1-2 cubic kilometers over last years eruption and that leaves a hole. An eruption at this location is unlikely. It is more likely that the next event here will be in one of the other volcanoes in the area. With an eruption every few years, predicting that Iceland will erupt again is pretty safe. I would keep an eye on Hekla. Thank you for the information. Have a lovely day. Very large earthquake near Zebak in Afghanistan. Very sparsely populated but that won’t be any help to the people living there. Odd…. on initial page load, the original comments noting this were not there, now they are. Sorry for the duplicate report. and larger quakes. quite shallow. 7km or so..
Now why would bears take up an interest in Seismology? Not a spelling issue. Could be as simple as a missed “it”. I’ve had my phone remove entire words before, so it is not uncommon for auto checkers. They have a tendency to make someone speak gibberish. It’s also not that odd for a person to drop a word on their own, leaving it to be inferred by the context of what was said. It’s one of the ways that languages change and grow into different languages. In this case, the literal meaning is what I played on, yanking your chain. The inferred meaning makes perfect sense. “It bears watching”. 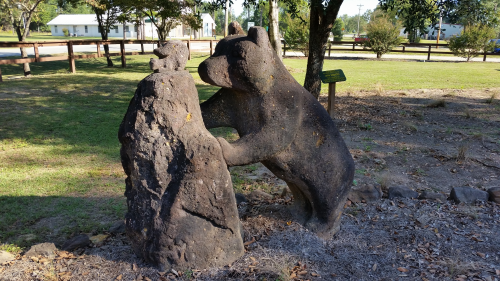 Now, since you mentioned a fondness of Smokey Bear, up at the Forestry site in northern Santa Rosa county, they have a “rock” carving of a bear. (could be formed concrete that has been sitting out for quite some time.) What struck me odd about it, was that it appeared to be sniffing a squirrels arse. Or at least showing a keen interest in it for some reason. Overbearing bear bares all. Bears spade but barely digs the barley bere. Hat bearer bares watching. From Bering News. And posted the camper by air to O’hare. But of course, where else! It was pointed out to me that American constitution gives everyone the right to arm bears. Explains it all. Does make more sense than the right to bare arms. Dunno, the sight of an angry mob chasing someone down with severed appendages seems a bit pythonesque. Edit Add: And as I noted to a friend the other day, it’s pretty hard for someone to cut your head off if you blow their arm out the window with a 12 gage. “Sire, the peasants are demanding the right to bear arms! Off topic but I have lost my link to the drum plots in Iceland, used to have a map with the different stations to click on and view. I’ve searched but can only find a list now. If anyone has the link please share! Thanks Mike, not the one I had though! One thing that I made it a point to do when we went to Crete, was to take the tour to Knossos. Though I was a geology novice, I was aware that the explosion of Thera was a major trigger for the downfall of Minoan culture. Anything that could put large pumice blocks on top of a ridgeline had to be quite energetic. Of the remaining art, the bull leapers always stuck in the back of my mind. It was difficult for me to imagine that in action. Thanks to a bit of wandering around the internet… now I know. Here is a clip from that video. Bulls still figure heavily in modern culture. Even the Honda logo is remarkably similar to the double bit axe head iconography of Minoan culture (which looks like a pair of horns and adorned the tops of many of their buildings). And the Toyota logo looks quite a bit like a stylized bulls head. http://k2radio.com/huge-crack-in-the-earth-opens-up-in-the-foothills-of-the-bighorn-mountains/#photogallery-1=2 can someone here possibly explain this? Well, it is in the northern region of the Basin and Range province. Graben and Horst formations prevail throughout the area. Since extensional forces are predominant, it seems likely that a crack would form somewhere in the region. I’m curious if there has been any nearby seismic activity to accompany it. Not tectonic. It it is in soil, and rather dry soil. This looks like a landslip. I would be cautious about being on the downslope side when the rains come. Interesting article interviewing locals about Cotopaxi. It shows how even with the efforts of mitigation, many people are simply stubborn to leave, don’t have the means to leave, or have other issues as simple as children being away at school. IMO has probably run out of them and will have to wait for the next fiscal year before they are assigned new ones. Two stars on the IMO map. Localised harmonic tremor pulse registered at VON station. This is very important. The signal could come from either Bardarbunga or perhaps Tungnafellsjokul. Good catch Andrew! Can’t see it on other nearby SIL stations and the tremor also shows up on the Vonaskard drumplot but not other nearby ones, i.e. this supports your conclusion about it probably being localised to Tugnafellsjökull. Ever since we saw that dike shoot off from Bardarbunga to Tungnafellsjökull a year ago, we have wondered what, if any, the end result might be. One educated guess would be that since there are no known Holocene (last 10,000 years) eruptions at “Tfj”, the activity represents the “re-awakening” of the hydrothermal system as heat and, possibly, also magma slowly rises upwards in the volcanic system. A few days ago, there was a very tidy little line of quakes spread out like a curtain, as if something was moving up. I realize this is a little off-topic, but I am curious about this data I’m looking at. I sorted through all the earthquakes >M3.0 for the past year along the San Andreas fault and got this result. My question is this: These tectonic plates are supposedly moving at a constant rate (5 cm per year?) yet get stuck because the plate edges are irregular. The longer the stick, the larger the quake when it finally gives. Therefore if we watch where there aren’t quakes along plate edges, should we be more forewarned? Are the places near where I put the arrows in more danger than the places near where there has been movement? Does this support the concern in Seattle? For some reason the arrows didn’t show up. They are north of LA and outside Seattle and Portland. Yes, that is reason for concern. A lack of earthquakes along a moving fault can mean that the movement is smooth (low friction between the plates) or that things are stuck. For the Seattle region, a quake with M=8 is entirely possible in the next century or so. I don’t know whether there is anything special in the region north of LA. 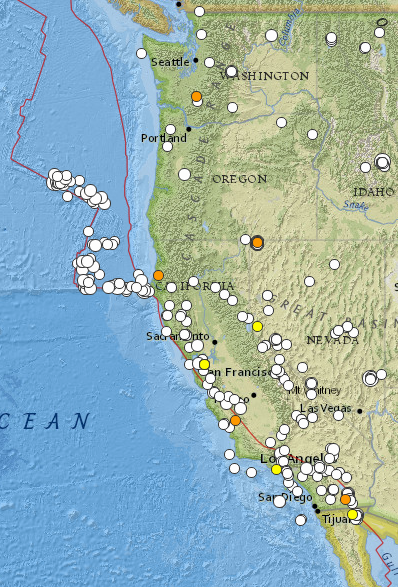 But the Portland coast has regular large earthquakes, every few hundred years or so. As albert notes, some aseismic regions are due to low friction areas. I know one region of the San Andreas was drilled where there was a quake, and at the approximate depth of the quake, when they penetrated the fault they found something similar to talc or soapstone. This is a serpentine rock. (Specifically, hydrated magnesium silicate). Another relatively common mineral from the serpentine group that is widespread in California is Chrysotile. Also known as Asbestos. In fact, there has been alarm in some housing subdivisions that are built upon outcroppings of Chrysotile deposits. Those are the epicentres (surface projections). What about depth as the hypocentre (exact 3D location) has a major bearing on the interpretation? forget the Portland Seattle area, that is not Andreas fault territory, it’s the Cascade fault which is also of a different type. You are right that it is a different fault with different motion (subduction). But a name change is not enough reason to forget about it. It is a locked region which is on the list of expected major earthquakes. This list included Kathmandu (which had a lucky escape), Istanbul, New Zealand (North Island). Any of these may not happen any time soon, but they have an above average risk of a damaging event. Each line is 4hr 10 min. Not sure what these signals are or aren’t, but people should know that the Vesuvius drum plots are very susceptible to human noise and interference being in a large metropolitan area. 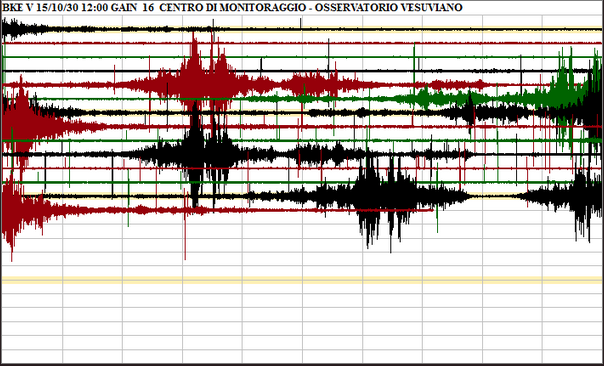 Tourist busses travelling to and from the summit and passing within 50 m of the seismometers. I have been reading volcano café for a while now and have been waiting and cant wait to hear what is the number Uno in your list. Can you give us a hint when you are going to publish your finds and tell us your thoughts what should be the ONE. Personally I was going for Mount Fuji in Japan or Santorini in one of the Greek Islands. I don’t know what #1 is, but I would put a solid bet it won’t be either of those. Fuji can cause some havoc, but hasn’t shown propensity towards erupting in a massive fashion that would cause the calamity required to be #1 on the list here. Over the last 10,000 years, only 3 of Fuji’s many eruptions were VEI-5, with one of those VEI-5 eruptions being in 1707. While Japan was much different back then, there werent mass casualties back then, and I think infrastructure damage would be the bigger worry if a similar event were to happen again. As for Santorini, we won’t be seeing a large eruption similar to the minoan eruption any time geologically soon. Volcanoes that have large VEI-7 eruptions and go caldera need a long time to recharge their systems before they can do anything remotely similar. Also, there just isn’t enough population near Thera to warrant the possible life-loss required to be on this list. My guess? I would personally put money on a volcano in either Indonesia or Central America. I would however consider an Iceland rifting eruption as a dark-horse candidate since this place loves Iceland, and there are arguments that the ripple effects due to environmental factors caused by Laki killed hundreds of thousands (although that was during the 1700s with much worse farm technology and health technology, so it’s tough to compare). These two volcanic arcs simply have the highest population density near large volcanic systems. Both these areas also have a lot of volcanoes that can go boom in a big way. Maybe one of the 49 volcanoes within the city limits of Aukland? 49? There is only room for one in the list.. I am curious what other volcanoes people come up with. I think it is provisionally scheduled for two weeks from now. There is some press interest and that dictates time scales to some degree. New post by Albert; “Australian Volcanoes”, is up! I am an “old faithfull” follower of VC.org – and love your website. My question is, what do we know about underwater volcanos on iceland. Any around Grímsey?